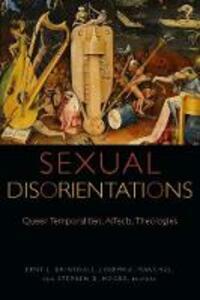 Sexual Disorientations brings some of the most recent and significant works of queer theory into conversation with the overlapping fields of biblical, theological and religious studies to explore the deep theological resonances of questions about the social and cultural construction of time, memory, and futurity. Apocalyptic, eschatological and apophatic languages, frameworks, and orientations pervade both queer theorizing and theologizing about time, affect, history and desire. The volume fosters a more explicit engagement between theories of queer temporality and affectivity and religious texts and discourses.